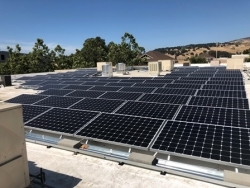 Novato and Sonoma based SolarCraft announced the completion of a 54.3 kW solar power system at Anette’s Chocolate Factory, providing 100% of the electrical needs for its Napa, CA production facility. Designed and built by SolarCraft, the new system will reduce Anette’s utility costs by over $23,000 every year, while reducing the load on the local utility grid. Novato, CA, September 19, 2018 --(PR.com)-- The solar photovoltaic system is roof-mounted and consists of 151 high-efficiency, 360-watt solar panels, powering their offices and production facilities with clean and sustainable solar power. Now powered entirely by renewable energy, Anette’s Chocolates is committed to environmentally conscious and sustainable business practices. By going solar, they will reduce their carbon footprint while saving millions in utility costs in the decades to come. The system’s solar electric panels are expected to generate approximately 79,495 kilowatt hours of energy annually, providing 100% of the winery’s annual energy consumption. Over the life of the system, the solar energy system will spare the air over 1 million pounds of harmful greenhouse gases. The air pollution saved will be equivalent to eliminating over 3 million miles of driving. Brent, Mary and Anette have worked together for nearly 27 years creating award winning confections, truffles and chocolate sauces. Brent, the Master Chocolatier, creates wonderful Artisan pieces using recipes that have been handed down and perfected over the past 70 years and others that are uniquely his. Anette's Chocolates has won numerous awards for their creations. In addition to the production facility, Anette’s has two retail shops in downtown Napa, CA. SolarCraft is 100% Employee-Owned and one of the largest green-tech employers based in the North Bay for over 35 years. SolarCraft delivers Clean Energy Solutions for homes and businesses including Solar Electric, Solar Pool Heating and Battery / Energy Storage. With over 7,000 customers, our team of dedicated employee-partners is proud to have installed more solar energy systems than any other company in the North Bay. www.solarcraft.com.